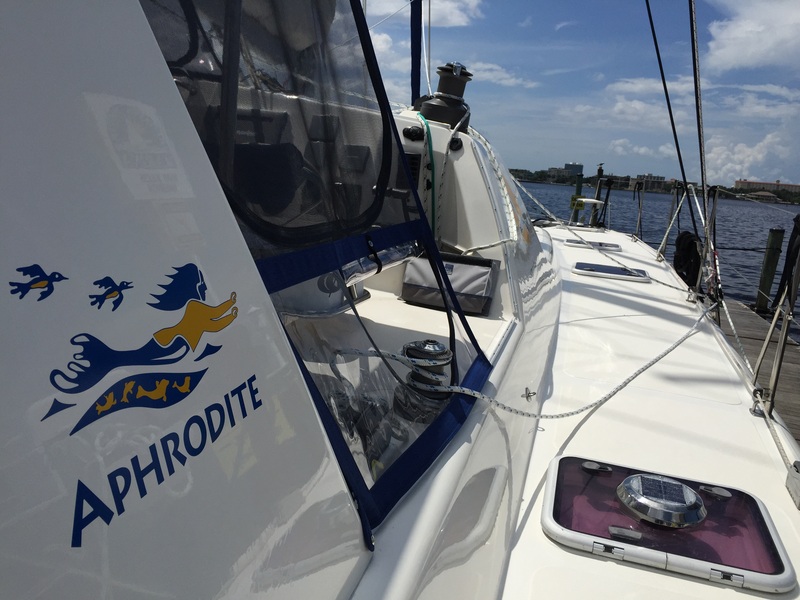 Today we took SV Aphrodite for a test sail. The purpose was to put up the sails, test the engines, and identify any issues that may remain following our refit. SV Aphrodite about to embark on the test sail. Aboard for the test sail, were our advisor, Pat Reischmann, as well as our friend and skipper Mark Burton – both of whom played an essential role in sailing and troubleshooting. My husband, Rick, and I were the crew. I have observed that a small crew requires a different level of responsibility than what I experienced when I sailed in Antigua. Essentially, there’s nowhere to hide. On SV Aphrodite I could use more confidence but I am happy and keen to help wherever I can. Yesterday, for example, I learned the importance of fenders. Hindsight is 20/20 – but it’s not enough to simply panic as your boat approaches the dock. Boat hooks retract and bend. A well-placed fender is your friend. And, today, I had the opportunity to practice on the helm for about two hours. Steering a straight course while factoring in the wind – does not come naturally to me. But now that we own a boat – a vehicle of the sea – I’d like to learn to drive shift. My skills at the helm might not get me across the Atlantic (just yet) but they were enough that Pat, Mark and Rick could do some troubleshooting. The consensus seems to be that there is too much flex in our boom vang. 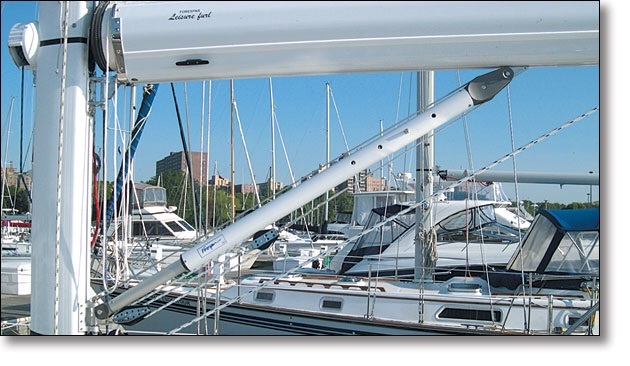 The boom vang provides support to the boom, which in turn, supports the shape of the sail. Here is a picture of a boom vang. A boom vang provides support to the mast. Initially, our boom vang bounced up and down like a spring. This motion affects sailing efficiency because the sail can’t maintain its shape. At the moment we have a temporary solution in place, and we are investigatng more permanent options. Overall, I think the test sail was a success. With the bulk of the refit work complete, it will be fun to see our kids’ reaction to the boat and their rooms, which I have filled with their clothing and some toys. Our children – Betty (9), Paul (7), and twins Henry and Karen (4) arrive in Florida this Sunday. The art looks great. You’re going to learn fast now.